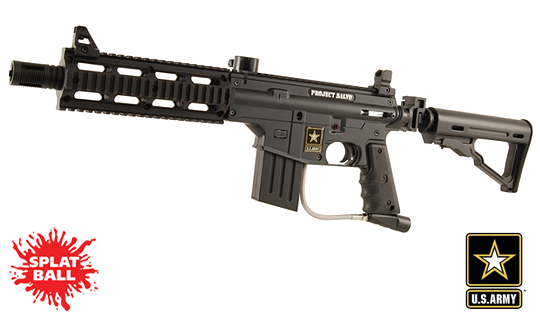 The Project Salvo paintball gun by US Army Paintball includes an AR15 style six position folding and collapsible stock and an AR15 style shroud with four picatinny rails for customization. The Project Salvo comes with a high performance 11″ quick thread barrel, removable and adjustable front and rear sights, and proven high performance in-line bolt system. It is compatible with the 98 Custom Response Trigger and Flatline Barrel.